Newtrend Bathrooms supply and install a wide range of bathroom and shower designs throughout Bloxwich in a fantastic range of designs and styles. Our range of bathroom suites are renowned for the highest quality across one of the largest choices of styles and features available. From contemporary to traditional, modern or unique, we have something to suit all tastes, styles and budgets. Our range also includes many accompanying fixtures, fittings and accessories so there is no need to trace up and down the high street, we have everything all under on roof. Although we can cater for every budget, we only use high-quality products, for peace of mind, which combine supreme craftsmanship with quality materials and elegance in design. Looking to Transform Your Bathroom? 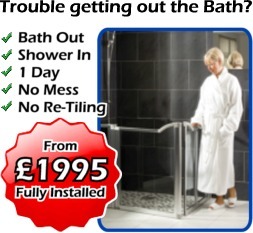 Newtrend Bathrooms offer a fantastic range of Easy Access Baths and Showers, for the elderly or disabled. We offer a full range of wetwall panels to match your existing bathroom with NO upfront deposits!